Kodak EasyShare One Digital Camera Software Driver and Firmware for Operating Systems. This firmware version provides: ability to connect to wireless networks that follow the recommended Wireless Internet Service Provider roaming (WISPr) guidelines; smoother playback for videos; improved User Interface. (Updated: 17.11.2018). 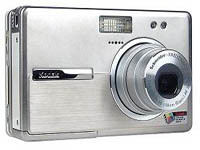 , and filed under Digital Camera and tagged 4 mp software, easyshare one 4 mp, easyshare one camera, easyshare one software, kodak easyshare one firmware, kodak one software.